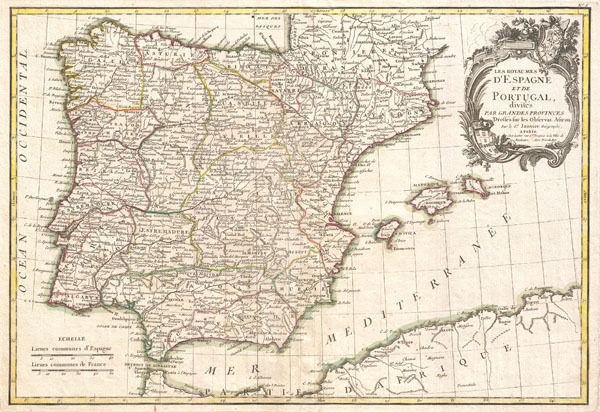 A beautiful example of Jan Janvier's 1775 decorative map of Spain and Portugal. Covers the Iberian Peninsula as well as adjacent parts of France and Africa. Prominently displays the Balearic island sof Majorca, Minorca, and Ibiza. A large decorative title cartouche appears in the upper right quadrant. Drawn by J. Janvier c. 1771 for issue as plate no. 23 in Jean Lattre's 1776 issue of the Atlas Moderne. Rumsey 2612.022. Phillips (Atlases) 664. National Maritime Museum, 215.